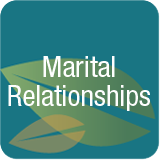 Marital Relationships – Couples plan to retire and grow old together, however this isn’t always the path life takes. What happens when one spouse accepts the responsibility of caring for another? What happens when caring for a spouse results in stress and illness for the healthy spouse? What are realistic expectations of care? What happens if care and the related responsibilities were not discussed in advance of care needs? What is the future for the well spouse and the spouse needing care? How do couples navigate unexpected situations?